X : The SRS air bag equipment is designed to deploy in a collision. *1 (With Front Passenger Air Bag Deactivation Switch) The front passenger front and side air bags and the front seat belt pretensioner are designed to deploy depending on the status of the front passenger air bag deactivation switch. *2 (With Side/Curtain Air Bags) In a side collision, the front seat belt pretensioners and the side/curtain air bags deploy (only on the side in which the collision occurs). 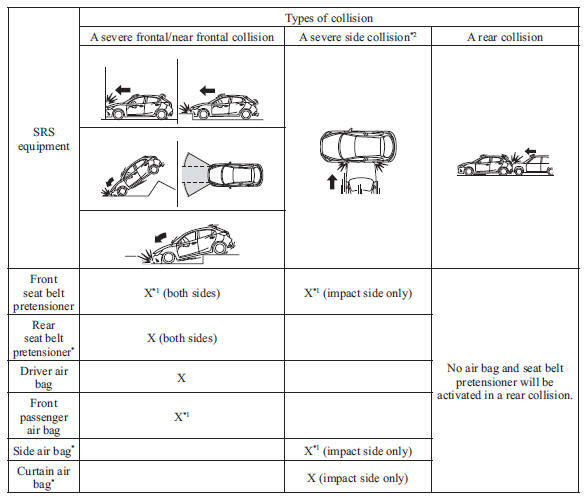 In a frontal offset collision, the equipped air bags and pretensioners may all deploy depending on the direction, angle, and rate of impact.